The Best Base and Top Nail Coats I've Tried! I have a really quick post for you all today before I run off to take pictures for next week's blog posts. I have my favourite base and top coats for nails to share with you all today. 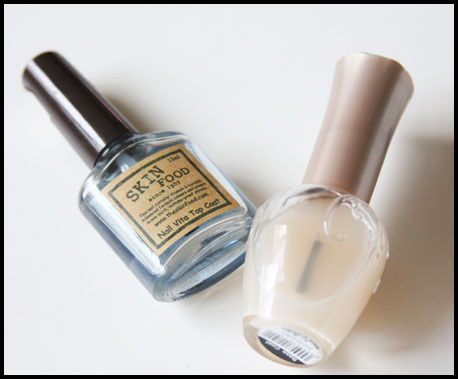 Introducing, Skin Food Nail Vita Top Coat and Elianto Base Coat. For years and years I've been obsessed with black nails, and for just as long, I've been obsessed with avoiding chips and cracks in my nail polish. I used to have the worst experience with even the best of nail lacquers - they always, always chipped within a couple of days of doing my manicure. It used to drive me bonkers! I discovered this combination by total chance - both products weren't purchased by me - in my Mom's nail polish bag. I needed to do my nails and didn't have my stuff with me because I'd left everything in Australia. The first time I tried it, I was surprised to find that my nails were still in good condition almost a week later when I wanted to remove the nail colour. The second time I tried it, my nail polish lasted so long I got bored. My no-chips-or-cracks record (with some wear on the tips of the nails) was 3 1/2 weeks. And this coming from me, who continually subjects her nails to all kinds of torture. I have to say, though - one thing that I'm not quite satisfied about is the fact that the Skin Food top coat isn't quite as high-shine as I would like it to be. I have seen the Seche Vite Top Coat in action and I have to say, I prefer the shine on that. But in the end, the Skin Food top coat wins out purely because of wear time. Okay, off to swatch and play with makeup!